A holarctic genus. Many species are boreal or montane, with disjunct distributions on isolated mountain ranges. The phylogenetic hypothesis shown is based the combined analysis of DNA sequences and morphology illustrated in Fig. 5 of Simonsen et al. (2010). NB: this is a Bayesian tree. Simonsen, T. J. 2005. 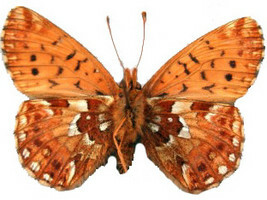 Boloria phylogeny (Lepidoptera: Nymphalidae): tentatively reconstructed on the basis of male and female genitalic morphology. Systematic Entomology 30:653-665. Simonsen, T. J. 2006. Fritillary phylogeny, classification and larval hostplants: reconstructed mainly on the basis of male and female genitalic morphology (Lepidoptera: Nymphalidae: Argynnini). Biological Journal of the Linnean Society 89: 627-673. Simonsen, T. J., N. Wahlberg, A. V. Z. Brower, and R. de Jong. 2006. 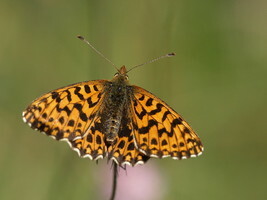 Morphology, molecules and Fritillaries: approaching a stable phylogeny for Argynnini (Lepidoptera: Nymphalidae). Insect Systematics & Evolution 37: 405-418. Simonsen, T.J., Wahlberg, N., Warren, A.D.,Sperling, F.A.H. 2010. The evolutionary history of Boloria (Lepidoptera: Nymphalidae): phylogeny, zoogeography and larval-foodplant relationships. Systematics and Biodiversity 8: 513-529.